On Friday, June 15, 2018 embattled former FBI Director, James Comey, tweeted a picture of himself standing in the shadow of a giant concrete gnome. The image quickly made its way into the national media with widespread speculation as to its meaning. The following is Don and Kim’s interpretation of the event. In his lucid dream triggered by eating spoiled food at a church picnic, Jim Comey accidentally crossed through a dimensional portal and found himself trapped in the Land of the Gnomes. After eating a bad tuna fish sandwich at a church picnic, former FBI Director Jim Comey laid down under a shady tree in the park to rest and nurse his upset stomach. He soon lapsed into a deep sleep and began to experience a lucid dream. Comey dreamt he was taking a long casual hike in the forest to engage in a period of solitary relaxation and introspection. He wanted to process the monumental events that had recently engulfed him. Lost in thought for the longest time, he suddenly realized that he was also lost in the woods. In an attempt to retrace his steps, he followed a shadowy path through a dark stand of trees. He eventually happened upon a small clearing where he beheld a strange figure in the distance. The figure beckoned him to approach and when Comey broke out of the gloom into the light of the clearing, he found himself standing next to a large gnome of considerable stature who towered over Comey’s six-foot-nine frame. The gnome identified himself as “Muirgheas, Lord of the Forest Gnomes” and asked Comey why he was intruding into the domain of the forest spirits. “Prithee bid me what is troubling thee,” said Muirgheas as he tapped fresh tobacco into his hand-carved pipe. “Lord Muirgheas, I am a good person and undeserving of what is happening to me. I have heard that gnomes possess supernatural powers. Might it be possible for you to use your magic to make my problems go away? “Well, I wasn’t so keen on going back anyway. So, what’s next?” asked Comey. In a fit of nostalgia for the happier times of yesteryear, Bernie Sanders and Elizabeth Warren demonstrate that they can still bring back the old days by dancing enthusiastically to the iconic tunes of the bygone disco era. The dance-off is on! 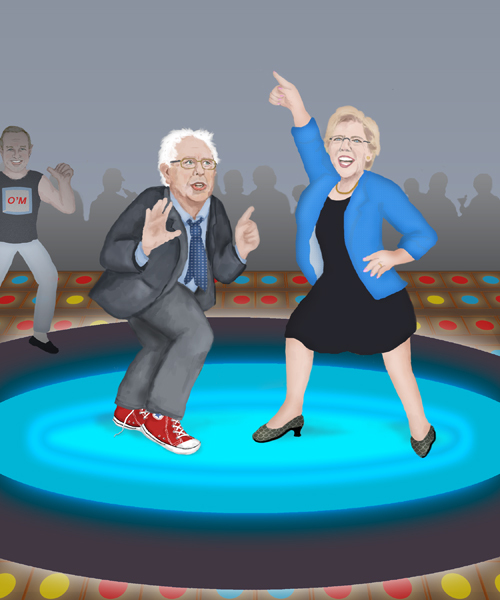 Bernie Sanders and Elizabeth Warren tear up the dance floor to the Bee Gees’ 1977 hit tune “Stayin’ Alive” proving that these two can still cut a mean rug. Bernie’s dance style is a little bit country and a little bit city, hip-hop, with some fancy two-step footwork thrown in. Liz relies heavily on The Hustle. Each incorporates a hint of Funky Chicken flavor to their moves. The competition begins to heat up as Governor Martin O’Malley gets ready on the sidelines to shimmy his way into the spotlight. The night is young and the cappuccino scented oxygen is flowing freely.